Download "Provider-Based Deterministic Packet Marking against Distributed DoS Attacks"
1 Provider-Based Deterministic Packet Marking against Distributed DoS Attacks Vasilios A. Siris and Ilias Stavrakis Institute of Computer Science, Foundation for Research and Technology - Hellas (FORTH) P.O. Box 385, GR 7 Heraklion, Crete, Greece Tel. : , fax: , Abstract One of the most serious security threats in the Internet are Distributed Denial of Service (DDoS) attacks, due to the significant service disruption they can create and the difficulty to prevent them. 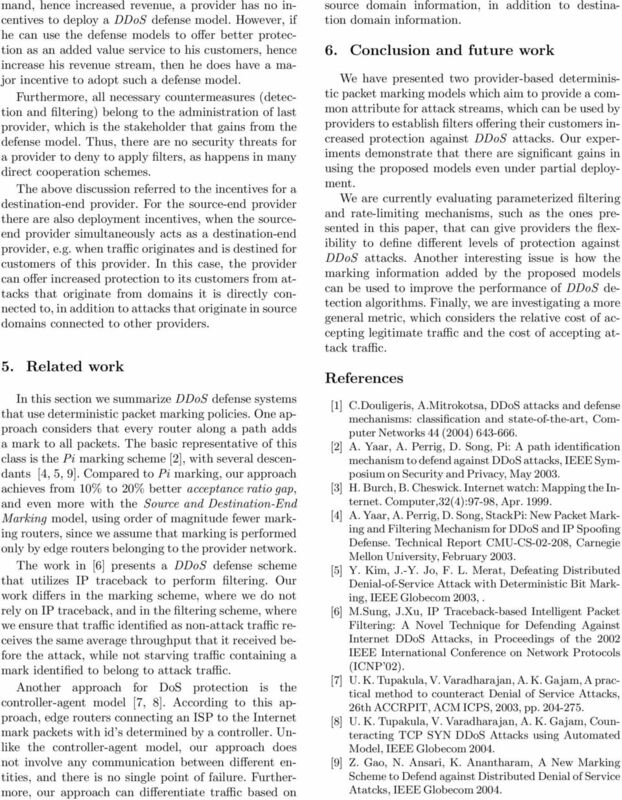 In this paper, we propose new deterministic packet marking models in order to characterize DDoS attack streams. Such common characterization can be used to make filtering near the victim more effective. In this direction we propose a rate control scheme that protects destination domains by limiting the amount of traffic during an attack, while leaving a large percentage of legitimate traffic unaffected. The above features enable providers to offer enhanced security protection against such attacks as a value-added service to their customers, hence offer positive incentives for them to deploy the proposed models. We evaluate the proposed marking models using a snapshot of the actual Internet topology, in terms of how well they differentiate attack traffic from legitimate traffic in cases of full and partial deployment.. Introduction Distributed Denial of Service (DDoS) attacks are one of the most serious security threats in the Internet today, undermining the further deployment of new services and limiting the usage of existing services, such as e-commerce. The main aim of DDoS attacks is the disruption of services by attempting to limit access to a machine or service instead of subverting the service itself . DDoS attacks achieve their goal either by con- The authors are also with the Dept. of Computer Science, Univ. of Crete. suming network bandwidth in the path close to the victim by sending huge amounts of traffic (bandwidth attacks), or by consuming the victim s memory and computational resources by exploiting an inherent protocol or implementation vulnerability (protocol attacks). The Internet s security vulnerability is mainly due to its open resource access model design, emphasizing on functionality and simplicity, but not on security. Furthermore, Internet s current routing protocols and forwarding procedures are largely based on destination addresses, and no entity is responsible for ensuring that source addresses are correct. Thus, anyone could generate attack traffic that appears to have originated from almost anywhere, by simply forging the source address in the IP header. This process is called spoofing and is widely adopted in flooding attacks... Desirable properties of a defense system In the last several years many DDoS countermeasures have been deployed. Most of the work in this area has focused on tolerating attacks by mitigating their effects on the victim. A powerful defense model should have several properties in order to be characterized as effective and secure. In particular, see also , a defense model should prevent only attack traffic from reaching the victim. This requires that the defense model differentiates the legitimate traffic from the malicious traffic, and limit the disruption of legitimate users. should not be itself a target for new attacks. Thus, it should avoid direct communication between different entities, avoid single points of failure, and be stateless, i.e. not keep per-flow information in intermediate routers. 6 .9.8 Source and Destination End Marking Model Efficiency Bits 2Bits 4Bits 5Bits 7Bits.9.8 Source End Provider Marking Model Efficiency 6Bits 4Bits 2Bits Bits 9Bits Figure 4. Source and Destination-End Provider Marking model performance Figure 5. Source-End Provider Marking performance with different marking field size in Figure 4. In particular, this figure shows that giving 2 or 5 bits for marking at the destination-end provider, which leaves 4 or bits for marking at the source-end provider, results in an overall increase of the performance compared to when all 6 bits are used for marking at the source-end provider. The opposite is true when 4 or 7 bits are used for marking at the sourceend provider. We are investigating how the topology and the length (number of hops) of the path between the source and destination influences this tradeoff. Note that increasing the number of bits used for marking at the destination-end provider offers protection against false marking attacks in the case of partial deployment, as discussed in Section Figures 6 and 7 show the performance of the Source- End Provider Marking and Source and Destination-End Provider Marking models, respectively, for different first marking routers. Different first marking routers effectively correspond to different sizes of the source domain, since we assume that the source-end provider marks packets at the edge router that connects it to the source domain. The results show that the acceptance ratio is higher when marking is performed closer to the source. Also observe that the Source and Destination- End Provider Marking model is less affected by the first marking router, compared to the Source-End Provider Marking model Partial deployment Next we investigate the performance of the two models in an environment of partial deployment. We as Source End Provider Marking Model Efficiency with Variable First Marking 2nd Hop Marking 3rd Hop Marking 4th Hop Marking Figure 6. Source-End Provider Marking with variable first marking router sume that some percentage of providers do not implement our marking model, hence their edge routers are legacy routers. In our experiments legacy routers are chosen randomly from the set of leaves representing legitimate users and attackers. Figure 8 shows that the Source and Destination-End Provider Marking model exhibits substantial gains even under partial deployment. In this experiment the marking field has a random value only in the part that corresponds to the source-end provider mark. 8 mand, hence increased revenue, a provider has no incentives to deploy a DDoS defense model. However, if he can use the defense models to offer better protection as an added value service to his customers, hence increase his revenue stream, then he does have a major incentive to adopt such a defense model. Furthermore, all necessary countermeasures (detection and filtering) belong to the administration of last provider, which is the stakeholder that gains from the defense model. Thus, there are no security threats for a provider to deny to apply filters, as happens in many direct cooperation schemes. The above discussion referred to the incentives for a destination-end provider. For the source-end provider there are also deployment incentives, when the sourceend provider simultaneously acts as a destination-end provider, e.g. when traffic originates and is destined for customers of this provider. In this case, the provider can offer increased protection to its customers from attacks that originate from domains it is directly connected to, in addition to attacks that originate in source domains connected to other providers. 5. 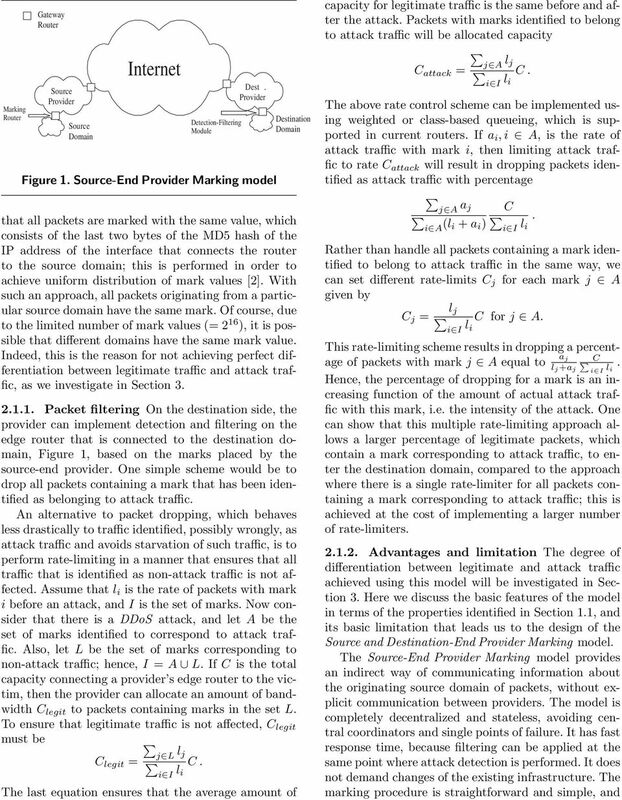 Related work In this section we summarize DDoS defense systems that use deterministic packet marking policies. One approach considers that every router along a path adds a mark to all packets. The basic representative of this class is the Pi marking scheme , with several descendants [4, 5, 9]. Compared to Pi marking, our approach achieves from % to 2% better acceptance ratio gap, and even more with the Source and Destination-End Marking model, using order of magnitude fewer marking routers, since we assume that marking is performed only by edge routers belonging to the provider network. The work in  presents a DDoS defense scheme that utilizes IP traceback to perform filtering. Our work differs in the marking scheme, where we do not rely on IP traceback, and in the filtering scheme, where we ensure that traffic identified as non-attack traffic receives the same average throughput that it received before the attack, while not starving traffic containing a mark identified to belong to attack traffic. Another approach for DoS protection is the controller-agent model [7, 8]. According to this approach, edge routers connecting an ISP to the Internet mark packets with id s determined by a controller. Unlike the controller-agent model, our approach does not involve any communication between different entities, and there is no single point of failure. Furthermore, our approach can differentiate traffic based on source domain information, in addition to destination domain information. 6. Conclusion and future work We have presented two provider-based deterministic packet marking models which aim to provide a common attribute for attack streams, which can be used by providers to establish filters offering their customers increased protection against DDoS attacks. Our experiments demonstrate that there are significant gains in using the proposed models even under partial deployment. We are currently evaluating parameterized filtering and rate-limiting mechanisms, such as the ones presented in this paper, that can give providers the flexibility to define different levels of protection against DDoS attacks. Another interesting issue is how the marking information added by the proposed models can be used to improve the performance of DDoS detection algorithms. Finally, we are investigating a more general metric, which considers the relative cost of accepting legitimate traffic and the cost of accepting attack traffic. References  C.Douligeris, A.Mitrokotsa, DDoS attacks and defense mechanisms: classification and state-of-the-art, Computer Networks 44 (24)  A. Yaar, A. Perrig, D. Song, Pi: A path identification mechanism to defend against DDoS attacks, IEEE Symposium on Security and Privacy, May 23. H. Burch, B. Cheswick. Internet watch: Mapping the Internet. 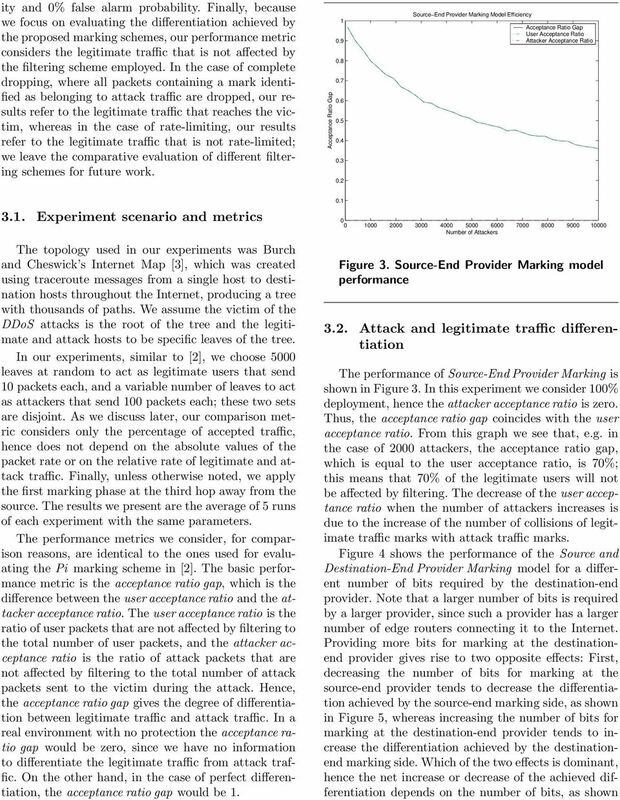 Computer,32(4):97-98, Apr  A. Yaar, A. Perrig, D. Song, StackPi: New Packet Marking and Filtering Mechanism for DDoS and IP Spoofing Defense. Technical Report CMU-CS-2-28, Carnegie Mellon University, February 23. Y. Kim, J.-Y. Jo, F. L. Merat, Defeating Distributed Denial-of-Service Attack with Deterministic Bit Marking, IEEE Globecom 23,. 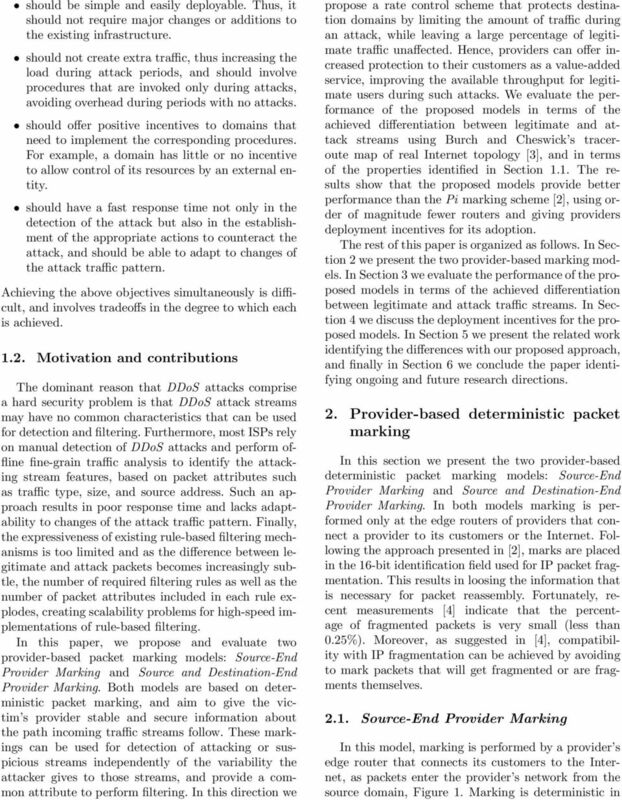 M.Sung, J.Xu, IP Traceback-based Intelligent Packet Filtering: A Novel Technique for Defending Against Internet DDoS Attacks, in Proceedings of the 22 IEEE International Conference on Network Protocols (ICNP 2). U.K.Tupakula,V.Varadharajan,A.K.Gajam,Apractical method to counteract Denial of Service Attacks, 26th ACCRPIT, ACM ICPS, 23, pp  U. K. Tupakula, V. Varadharajan, A. K. Gajam, Counteracting TCP SYN DDoS Attacks using Automated Model, IEEE Globecom 24. Z. Gao, N. Ansari, K. Anantharam, A New Marking Scheme to Defend against Distributed Denial of Service Atatcks, IEEE Globecom 24.